I'm an advanced beginner knitter. I understand the basic concepts, and have done some easy lace knitting and easy colorwork, can knit in the round on both dpns and circular needles and have done some bead knitting. My daughter is about the same level. 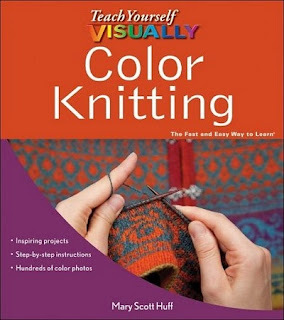 Since both of us wanted to learn a lot more about color knitting and have liked a lot of the other books in the Teach Yourself Visually series, we were excited about this one. It starts with color theory. Explaining the value, hue, saturation and temperature of colors as well as a bit about how to build palettes and find inspiration. The next chapter covers yarn types and explains fabric terms like drape and hand. Then it gets into the colorwork. What I like best about the Teach Yourself Visually series is the logical progression. Starting with simple things and working up to more challenging things. If you're a beginner, you will probably find new things even in simple techniques. It will help you master them more quickly by filling in gaps. Stripes is the first chapter, and it shows examples of how different stripe patterns are knitted. Starting with the absolute basics, it shows how to add a new color and carry a strand for garter or stockinette horizontal stripes. There are also two methods for working with circular needles to make jogless rounds so the stripes are even. Then there are projects using the technique. The hat is my favorite. That's the way the whole book laid out. Introduction to the technique, then a project to help you learn it. Each chapter/technique ends with an idea gallery. Slipstitch, stranded colorwork, intarsia, entrelac, modular knitting, then finally embellishment are all explained well with lots of photographs and projects that are whimsical and fun. Lots of hats and sweaters in this book which makes my hat loving daughter insanely happy. The charts are graphed on the square, instead of being more proportional to the stitches however each chart has a knitted example so you can see the distortion. They are so cute, a little mouse, a skully argyle and a woman's pump for example. The final chapter covers more advanced techniques for construction. It's well indexed to allow you to find what you need easily. I recommend it for beginning and advanced beginning knitters who want to step up their knitting and include images and color patterns. It helped my daughter and I a lot. We both prefer to work with our own charts, but the patterns provided will work with charts we design so we will learn more about the construction as well as color work.